REGISTRATION: Payment in advance will be available through noon on Mar 1st or when registration reaches 30. Payment in advance guarantees you a place and speeds up the process at the door. This half-day course provides a practical introduction to the practice of meditation. It will include explanations of the basic practices of Buddhist meditation, as well as the experience of two or more different guided meditations, and time to answer your questions. The purpose of meditation is to make our mind calm and peaceful. If our mind is peaceful, we will be free from worries and mental discomfort and so we will experience true happiness and relaxation. But if our mind is not peaceful, we will find it very difficult to be happy and relaxed even if we are living in the very best conditions. Rae Supeene is the Admin. Director for Bodhichitta Centre and has been practicing Kadampa Buddhism for many years . 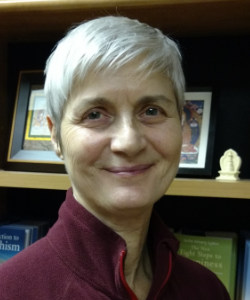 She is an experienced teacher and presents Dharma with great warmth and clarity.